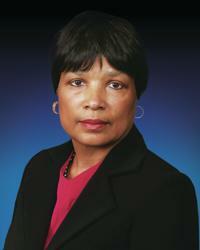 Pamela D. Randolph-Jackson, MD, is chair of the Department of Radiation, MedStar Washington Hospital Center. Her research focuses on radiation oncology, especially for use in treating breast, lung and gastrointestinal malignancies. She specifically is interested in treatments using positron emission tomography/computed tomography (PET/CT); magnetic resonance imaging (MRI)/CT fusion; three-dimensional conformal radiation therapy; and intensity-modulated radiation therapy (IMRT) for breast, rectal, uterine, prostate and lung cancer. At the Hospital Center, she serves on the Oncology Informatics Committee, the Clinical Quality Strategy Task Force and the Cancer Steering Committee. In addition, she developed the Dosimetry fellows program. Dr. Randolph-Jackson is certified in radiation oncology by the American Board of Radiology. Her research has been published in Neurosurgery. She is a member of the American Society of Therapeutic Radiology and Oncology, the National Medical Association and the American College of Physician Executives. Dr. Randolph-Jackson has been listed as a Top Doctor by Washingtonian magazine. Her medical degree is from the Quillen-Dishner College of Medicine, East Tennessee State University, Johnson City, TN. She completed an internship in Medicine and a residency in Radiation Oncology at Howard University Hospital, Washington, DC. She continued her training with a clinical fellowship at Thomas Jefferson University Hospital in Philadelphia.